This is brilliant. 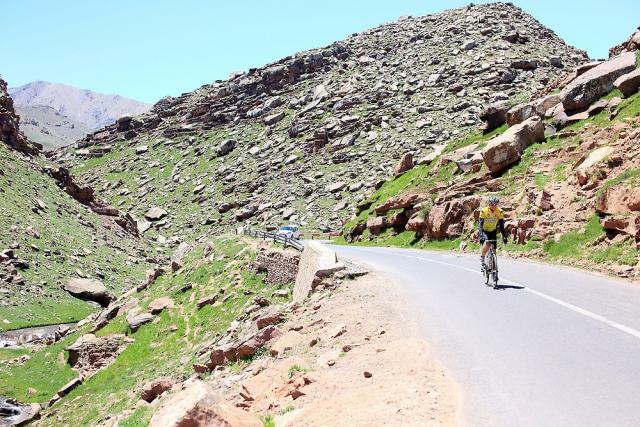 I’m over three hours into the Marrakech Atlas Étape having scaled the single big 2,129m ascent, the skies are blue, I’m way out in front on my own and my legs feel great. All I need to do now is ride back down the mountain and then do the 20 miles or so on the flat back to the start/finish. It couldn’t be going any better. Forty minutes later, I have to pull out with hypothermia. 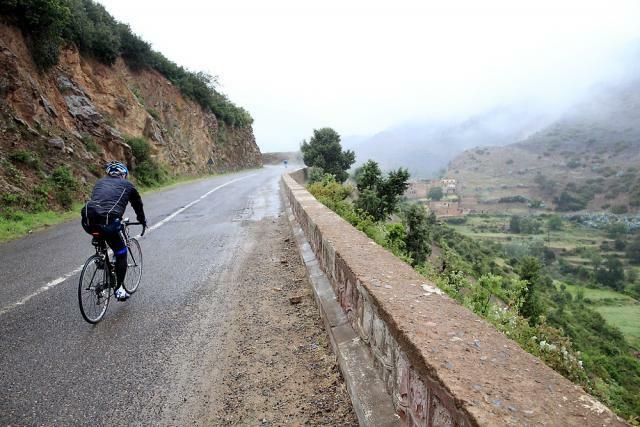 The Marrakech Atlas Étape is a brand spanking new sportive that starts at the Circuit International Automobile Moulay El Hassan on the edge of the Moroccan city (495m) and heads up to just below the ski resort of Oukaïmeden. The first 19 miles rise very gently – an average of 1.25% (or 1:80 in old money) which is so mild you don’t even notice it. 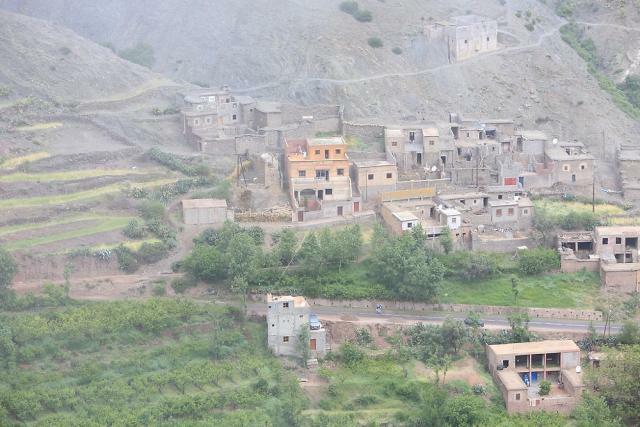 Then you do about seven miles in the Ourika Valley before branching off on to the Oukaïmeden climb – the Ouka Monster. This is where the fun begins. Over the next 18 miles you climb 1,649m, taking you up to 2,600m – virtually the same height as Galibier. The average gradient isn’t steep at 5.5% (1:18), but by any standards this is a big old climb. Then you turn around and head back the same way you came. About 170 of us rolled out of race HQ at 8am, some doing the 60km (37.5 mile) more or less flat route and some doing the full 140km (88 mile version). As well as being flat, the first section was straight and, with no traffic lights, roundabouts or junctions to disrupt things, most people rode it in a big pack. 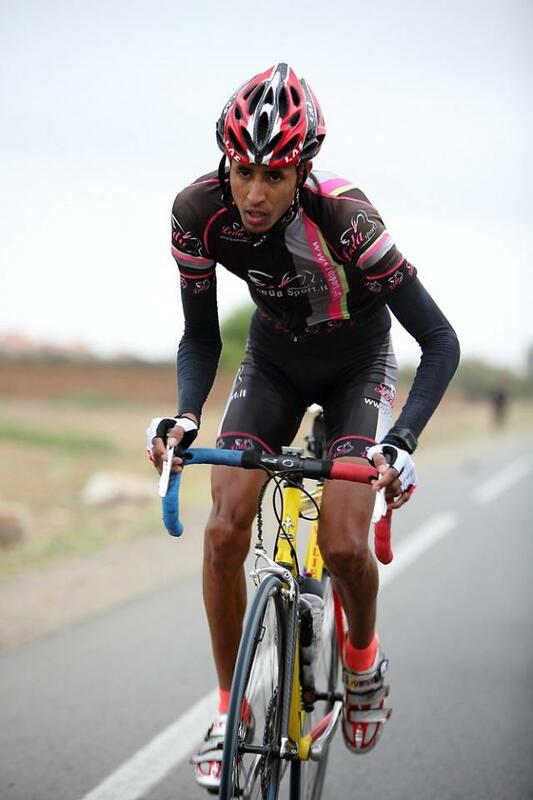 The riders were a real mix: Moroccan international racers, keen locals, expats, and people who’d headed in from abroad to ride in the African sun. Like a bunch of other journalists, I was there as a guest of event sponsors Halfords. The only problem was that it wasn’t sunny. In fact, it was decidedly unsunny. The organisers described it as 'unseasonably cold'. When I’d checked the weather every day for a week in mid-April, the temperature in Marrakech was anything up to 38°C. We’d arrived the afternoon before the ride and it was seriously hot and all the Brits who’d arrived the previous day were sporting some interesting looking sunburn. But today... not so much. It was grey. Still, it was dry as we bowled along, eating up those early miles, chatting away in the peloton about where we’d all come from, the riding we do… you know, the usual stuff. The Marrakech Atlas Étape has plenty of feed stations stocked with honey filled bread, dried apricots, mint tea... We stopped for the first one at 19 miles, got our cards stamped, grabbed handfuls of food, and everyone was immediately back on the road, the 60km guys heading back to the start and the rest of us going on. In no time at all, we were at the start of the big climb and the pace was hotting up. Well, actually the pace had slowed down but the terrain was much steeper so, if you prefer, the intensity was hotting up and people were dropping off the back of the group to take it at their own pace. If a climb goes on for nearly 20 miles, you have to do it at a pace with which you’re comfortable or you’ll blow sooner or later. Before long the group was down to five of us, then four, then three. 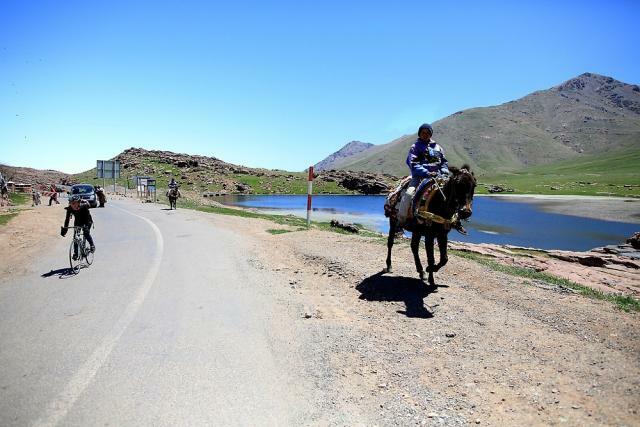 The two Moroccan riders I was with didn’t speak much English and my Moroccan Arabic (called Darija, apparently) is, you know, a bit rusty, so we mostly just got on with pedalling and trying to inflict pain on one another – it’s the international language of cycling. 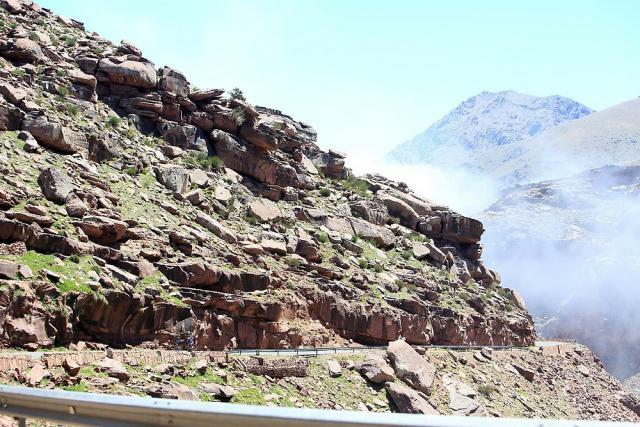 I’d love to tell you about the stunning vistas like those we’d seen on the event website, but just as we were starting to get impressive views across the Atlas Mountains and the valleys below the visibility started to diminish as we climbed into the clouds. Whereas before you could check out the roads snaking along the mountainside a couple of miles away, now you could only see a couple of hundred yards. Soon, we could hear the warning siren on the lead car ahead of us, but we couldn’t see the flashing lights. The gradient was never super-steep but the difficulty was that it was so variable. You’d get a tough section, then a shallower section, and so on. I was using a Garmin Edge 500 computer with a heart rate monitor and was trying to keep my effort as consistent as possible. The guys I was riding with were mixing it up too much for my liking. They’d go hard, then ease off. So they’d go away from me, and then I’d gradually bring them back – all very disciplined. It worked a treat. Most of the road surfaces were pretty good, even high up on the mountain. You’d occasionally get a bumpy section where the Tarmac was past its best – one, in particular, where it was distinctly jagged for a couple of hundred metres – and you’d make a mental note to be extra careful here on the way down, but it was mostly fine. We’re not talking velodrome-smooth here, but certainly nothing to worry about either. If you can handle standard UK roads, you can handle this stuff. We’d very occasionally pass through little villages where silhouettes in the fog would turn out to be people, and they’d clap and shout words of encouragement. At least, I think they were being supportive but maybe it was more bemusement, who knows? Anyway, it was all good as long as you avoided the goats, tried not to breathe in too much wood smoke, and high-fived the kids (that’s the children, not the goats’ kids – you didn’t have to high-five them). 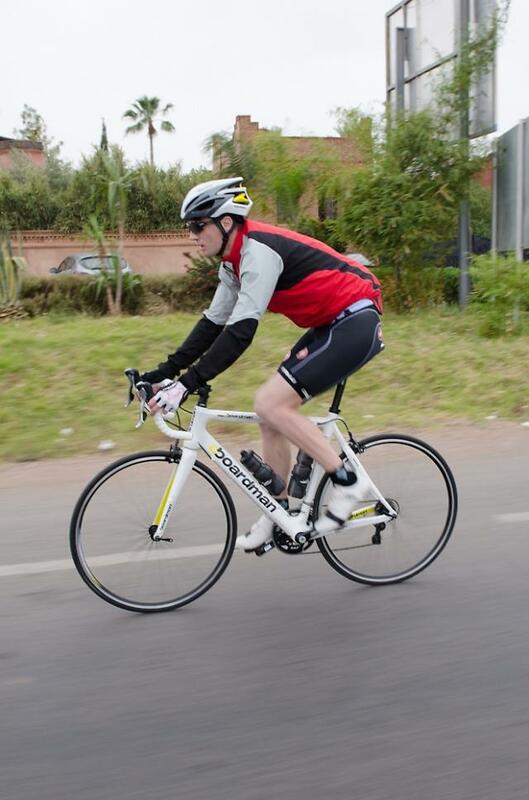 I was riding a Boardman Road Team Limited Edition bike provided for me by Halfords. It’s built around a carbon monocoque frame and fork with a largely Shimano Tiagra build, and it’s priced at £999.99. I’d ridden it a couple of times before I left home and was getting on with it really well. It’s certainly stiff enough for lots of out-of-the-saddle climbing and, although my large model was a bit weightier than I might have hoped at 8.8kg (19.4lb), it was handling all that climbing easily enough. Eventually, we swept up the one Moroccan rider who’d slipped away at the first feed station and he spoke good English so we got chatting. “Are you riding back?” he asked. What, back down the mountain, you mean? To the finish? Um, of course. As opposed to what? Who’d plan to do half the event? As it turns out, these boys would. So here’s me going hammer and tongs with three riders who are jacking it in at the halfway point and getting a car home. 1) Rather than riding to the finish in a group as I’d hoped, it looked like I was going to be spending a lot of time on my own in the not too distant future. 2) I’d seen that these guys didn’t have much extra clothing in their pockets so, although the conditions weren’t great, I was happy that I had way more kit for the descent than they did. And, being locals, they obviously knew what they were doing. So that was my reasoning shot to bits. On the plus side, that did mean that I was out on my own at the front of everyone who might potentially finish, and although this was a sportive it would have a winner who’d get a certificate and a handshake from the British Ambassador to Morocco back at race HQ, along with a round of applause... and who wouldn't appreciate that? Feed station break guy dropped off the back so we were down to just the three of us again, and we finally rose up through the cloud into clear skies and bright sunshine. The mountains were beautiful up here and you could see forever. I was hoping that all the greyness had finally burnt off for the day in the intense African sun and I could enjoy myself on the way home. One of the other guys dropped off the back a mile from the top and the other one made a break off the front. I didn't try to stay with him. He’d be stopping in a few minutes and climbing into a car while I'd still have a couple of hours left in the saddle. So I got to the top second and had my card stamped to say I’ve been. I couldn’t have been happier. I’d ridden well at an even pace, eaten and drunk the whole way up, and I was feeling strong – probably the best I’d ever felt at the top of such a big climb. I filled my water bottles, slung on the arm warmers and a waterproof that I'd taken off for the climb, put my gloves on and started heading downhill. I checked my computer when I saw the next rider heading up, and I'd been descending for four minutes. At a rough calculation, I was going downhill about three times as fast as I’d been riding uphill, so those four downhill minutes equalled about 12 uphill minutes, meaning I was maybe 16 minutes ahead, something like that. So there’s me thinking that I can get down the mountain and ride the 20 miles back to the finish quarter of an hour slower than the next guy and I'll still be first rider home. Cool. Have you ever had hypothermia? I’m guessing not too many of you have. 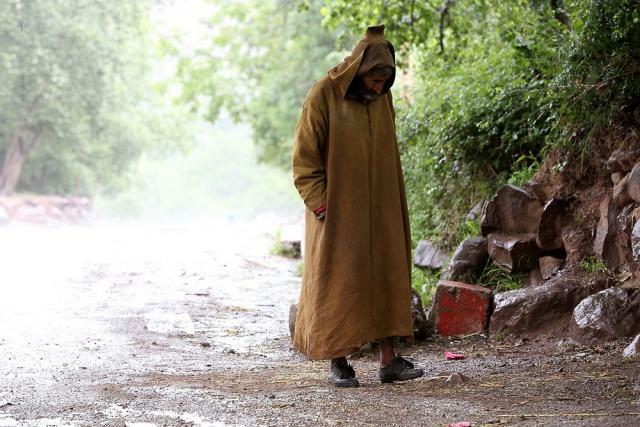 What about hypothermia in Africa? While doing sport? A quick show of hands, please. Just me, then. It’s not great. I’ve ridden plenty of big mountains in the Dolomites, Alps, Pyrenees, Iceland... I’ve ridden Peyresourde, Aspin, Aubisque, Tourmalet and Osquich – 5,000m of vertical climbing and 200 miles – in a day, and a rainy day at that. Actually, I got really cold on the first descent of that ride, but it was 5am in France. 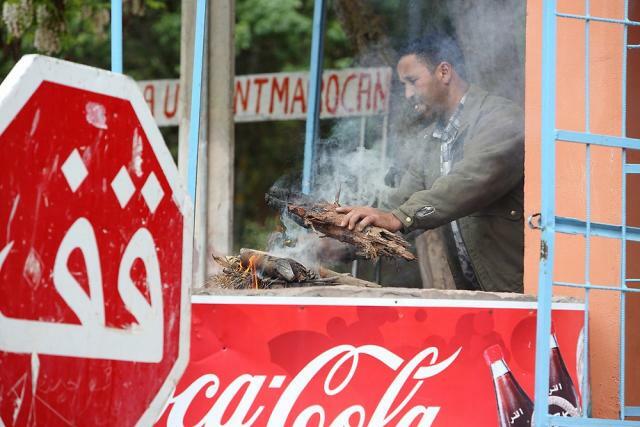 Here, it was midday in Morocco. Still, with all that experience behind me, I really shouldn’t have got this wrong. But I did. I have no excuse! Usually when you climb a massive mountain, the temperature drops but you’re working so hard that you stay warm, correct? Not always, but usually. Then, when you start the descent, you’re not pedalling so hard and you’re going fast through cold air so the wind chill cools you down really quickly, especially if you’re soaked with sweat from the climb, which you frequently are. That’s why you put on some arm/leg warmers, a windproof and/or whatever else you need to get you back down to the bottom where the air is warmer and you’ll be pedalling properly again. You might be cold for a while but as long as you keep your legs and fingers moving, you’re down the mountain before it really gets to you. That’s how it usually works. According to my Garmin, it was 8°C at the top of the mountain. After just a couple of miles of descending the temperature was already back up to 10°C. Fine. I was feeling chilly but the temperature was climbing. I’ll soon start to feel comfortable again. This is all going to plan. 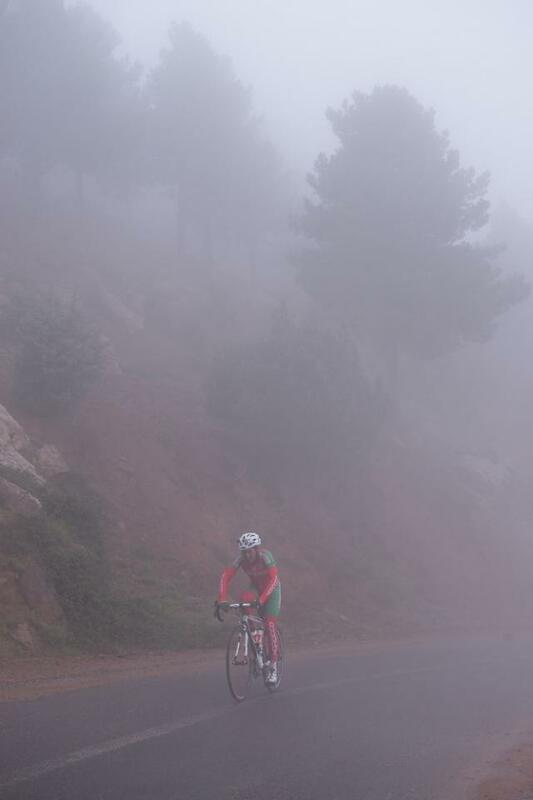 But after 15mins of descending, I was back in the cloud and the temperature had dropped to 9°C. I was making a massive effort to get my legs pumping at every opportunity and to keep squeezing my hands to keep the blood flowing. 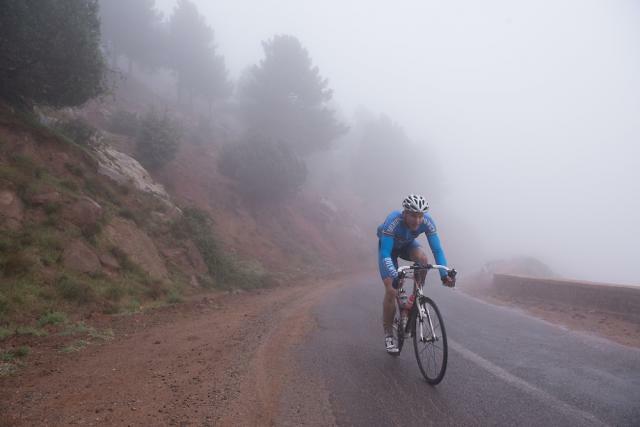 After 20mins of descending, it was down to 7°C – and a wet 7°C. That damp air was robbing me of any heat and very little of the sun’s warmth was getting through. I was starting to feel really cold so I stopped the bike to eliminate the windchill, and started running on the spot and swinging my arms to sort this out. I did some standing press ups against a big boulder by the side of the road, but none of this was making any difference whatsoever. The wet air was just making me too cold. I decided there was no benefit to being stopped. I might as well keep descending and either get to warmer air or the next food station as soon as possible. I got back on my bike and pressed on. After 25mins of descending the temperature had dropped to 6°C. It’s approaching midday yet this is the coldest it has been so far. I stopped again and went through the same routine with the same result: nothing. Right, I’m just going to get to the next feed station and worry about it then. I actually arrived at the feed station sooner than I expected, but after 40mins and 1,000 vertical metres of descending it was still only 8°C, the same temperature it had been at the top. Mountains reserve the right to do this. They can kick you in the teeth whenever they feel like it. By chance, a lot of the other journalists and guys from Halfords were at the same place, stopping to get food on the way up. Call me Miss Marple but I soon deduced that I wasn’t looking too good. I could tell by the way they were glancing at one another as if they thought they should stage an intervention and just needed to decide who should initiate it. And did they really want to head on up to the top if this is the state they might be in when they came back? Let me tell you how cold I was. I was really cold. I always get colder than everyone else to the point that it has become a running joke here at road.cc, but even by my own standards I was absolutely freezing. The guys were giving me hot mint tea and I was shaking so much that half of it was going on the floor. Seriously. You know how people are in cartoons when they’re supposed to be frozen? That was me. I was get-the-medics-in cold. So they got the medics in and the medics said, “You ain’t going nowhere, son.” But in French. I still thought I could carry on until I realised I had about 12 miles of descending remaining before I could conceivably get the legs turning properly. That’s 30mins if I stayed on the brakes to keep the wind chill down, 20mins if I went for it. Either way, it simply wasn’t going to happen. Not even close. It wasn’t a question of implementing rule #5. Game over. I stood as close as I could to the fire at the food station and watched other riders come past, none of them wearing as much as I had on. Oh well! 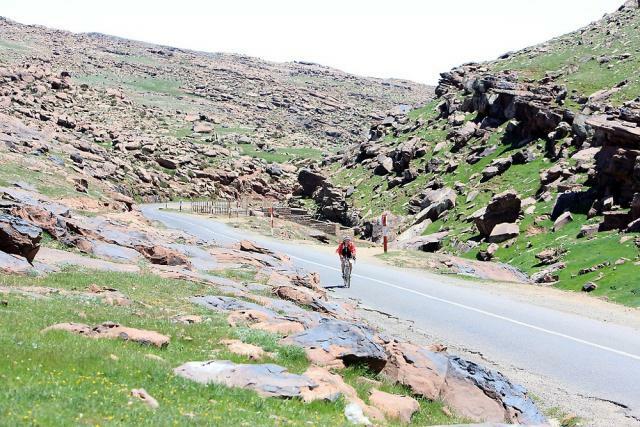 The organisers actually stopped riders from making the descent later on after other people found themselves in a similar predicament, bussing them to the finish instead, but 32 riders made it up Oukaïmeden and back. If you’re reading this thinking that you’re not the sort of jackass who would make a mistake like this, well, you might be right but that’s what I thought too. I think that’s my first ever DNF in any bike event, triathlon, run or whatever. I’m embarrassed because I got caught out by unusual conditions, and that shouldn’t happen. I got it wrong. 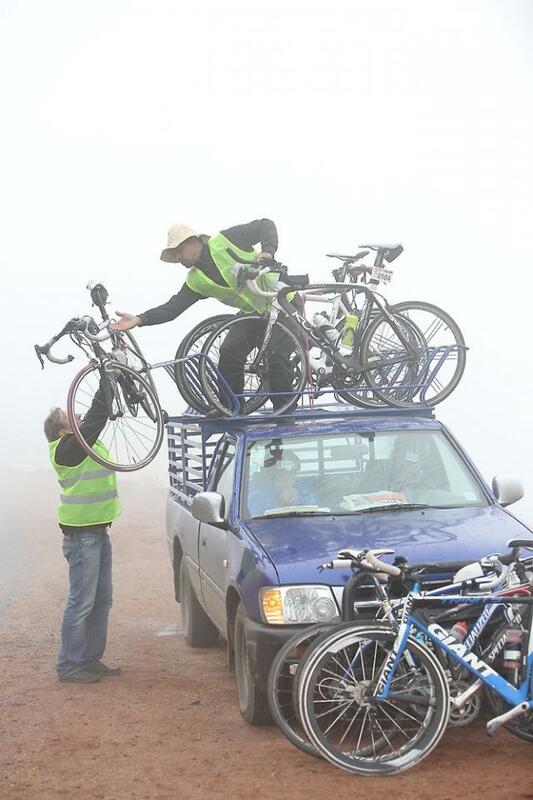 That said, I wouldn’t have set off up a massive mountain on a grey day had it not been a fully supported event. I’d filled one jersey pocket with clothing, one with a spare tube, multi tool, pump and so on, and kept one for food. If I had my time again, I’d take a saddle pack and sling the tube and multi tool in there, and fill two pockets with spare clothing. Whether that would have made enough of a difference for a reptile like me on that particular day, I’m not sure, but it would certainly have helped. Climbing the Ouka Monster was a whole lot of fun and a big challenge, and on a better day we’d have been treated to some spectacular scenery. Of course, the ride didn’t work out how I’d hoped – take it from me, hypothermia is an experience you could definitely live without – but, on the other hand, that’s what cycling is all about, isn’t it? Highs and lows. Ups and downs. Triumph and disaster… Stuff like that. It is for me, anyway. Salt and vinegar. Laurel and Hardy. 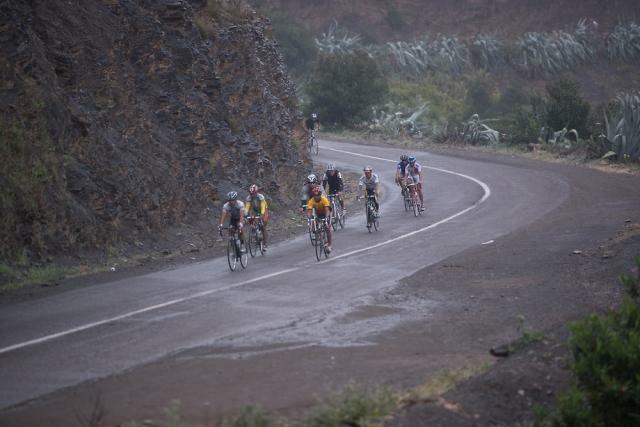 Would I go back and ride the Marrakech Atlas Etape again? 100%. 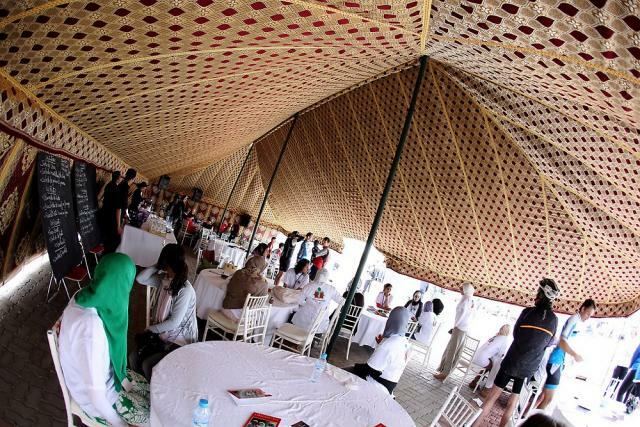 It was a great event, super-friendly and extremely well organised. I reckon it’ll do really well in coming years, and chances are that the weather will be stonking… as it was the following morning, ironically enough. In fact, I remember thinking that as I climbed the steps onto the plane in bright sunshine. “How ironic,” I thought. 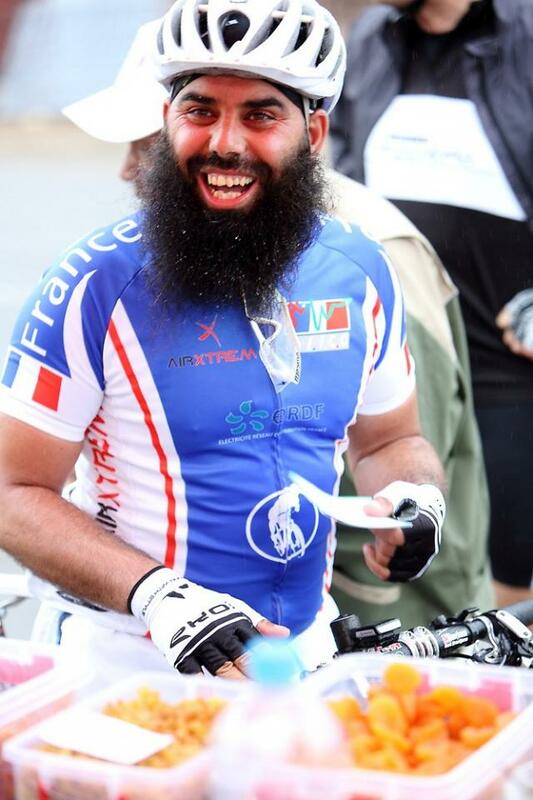 Congratulations to the 32 riders who finished the course, and particularly to first finisher Aimad Bouchtaoui (I think this is him in the pic). 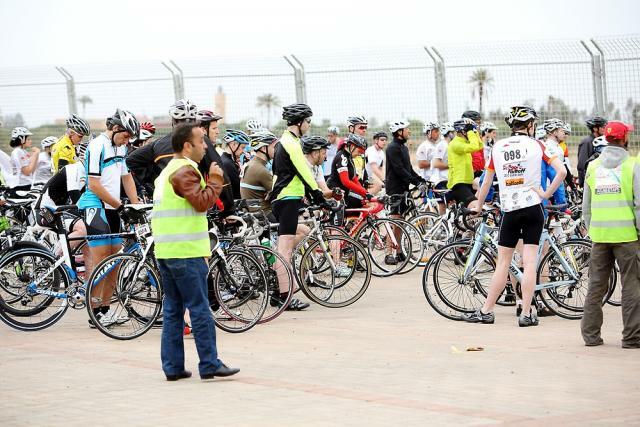 Registration for Marrakech Atlas Express 2014 opens on 1 September at www.marrakech-atlas-etape.com. The entry fee has yet to be set but the base entry is likely to be around £80 and there might be different options and packages available. 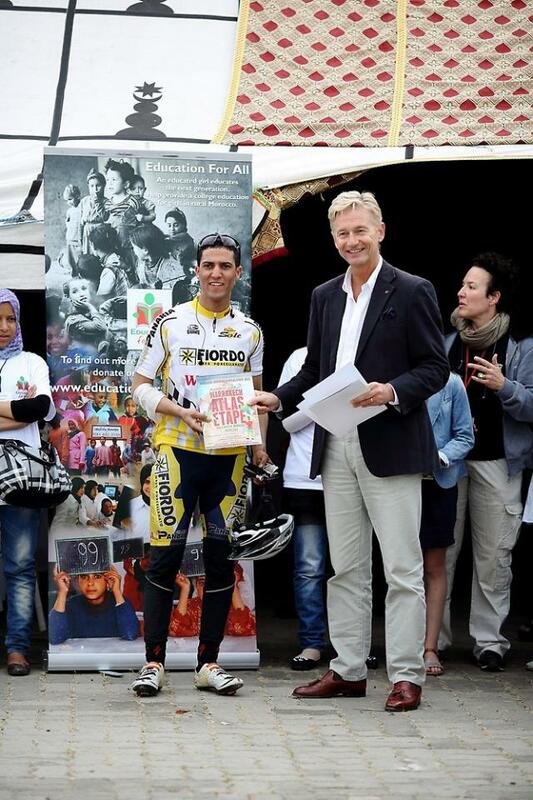 The Marrakech Atlas Etape is organised for the Education For All, a non-governmental organisation that builds and runs girls’ boarding houses near secondary colleges to allow girls from rural Morocco to continue their education after primary school. For more info go to www.efamorocco.org. Pics Most of the pics here are © Robin Kitchin although several are © Still Images. Click on the image and the relevant photographer is given in the picture title. Wow! Sounds like an epic ride. I dont see what much more you could have done, considering when you flew out you were expecting 38 degrees! What was it like riding on the roads over there with regards to other traffic? - I have been twice and being in a taxi was scary enough! Nah, I didn't have as much stuff as I needed on the day, and that's down to me, isn't it? I've got more bike clothing than pretty much anyone else on the planet – I'm reviewing it constantly – so no excuses! Still, worse things happen at sea etc. Traffic? There was very little and it was all perfectly safe. We started on the edge of the city and it was fine. On the mountain, there was virtually none. Just a few cars in the whole time we were on it. We saw more goats than cars. Not an issue, I'd say. Mountains are always the boss. Doesn't sound like you could do much different. 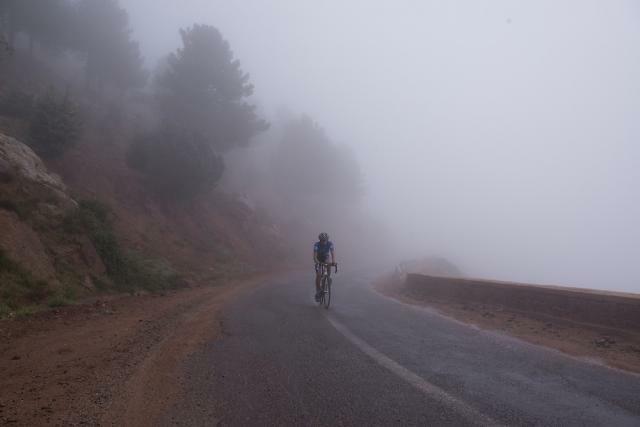 I'm doing the Raid Pyrenees this July and I'm dreading the possibility of having a freak weather day. I hiked to Gavarnie and the day we set out it was heavy rain and thunder storms all day. The car park was a river, so I hope that doesn't happen. The only tip I would have (and maybe this wouldn't work for Morocco in any respect) is to get the predicted temperatures at the top and bottom of the ride on the day and pack for anything. Given that there were only 32 finishers it doesn't suggest that too many others could stomach it and few who packed for it. I wouldn't discard the inner tube because its game over with a puncture. OMG, this looks epic. A friend has been talking about going to Morocco for ages but I never had a reason. Now I have to find out how to fly my bike. Or add it to a long list of unfulfilled ambitions. It was roughly an hour on the flat, 2hrs uphill, 40mins getting chilled to the bone on the descent. Don't get me wrong, it was still one of the funnest and funniest weekends I've had in ages... just with a touch of hypothermia in the middle! What gears did you use? ; go on really plug that Boardman, and halfords might send you back. Why am I even asking, I don't do hills. This sounds like I'm making it up (I'm not) but a guy that I work with was finisher number 32 on this...and did the entire thing on a P-type Brompton. He said the conditions were absolutely shocking but he had plenty of clothing on and just ground it out. 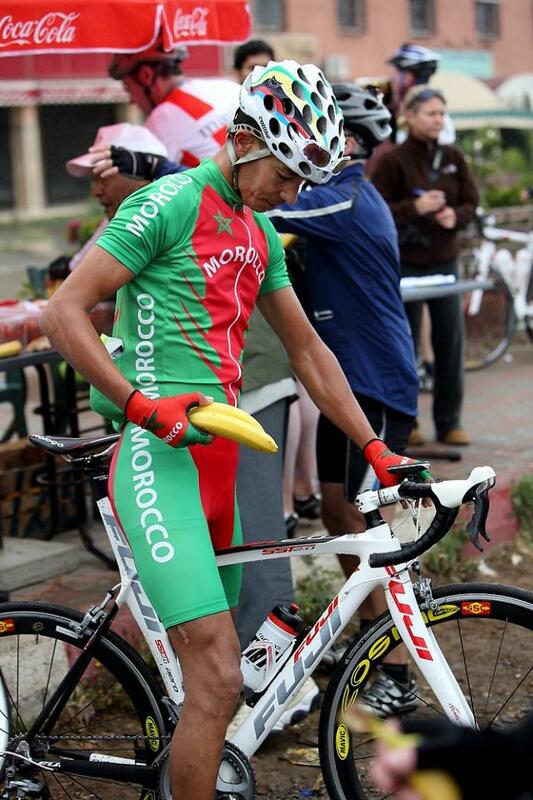 According to his Strava record he hit 82 kph on the way down. I've no idea how far off Strava can be but even if it's wrong by 20% that would terrify me on a Brompton. @Colin-Peyresourde - rode the Raid two years ago next week. It's a hell of thing, especially if, like for us, it rains every single day. Except when we were climbing the Tourmalet. Then it was snowing. Hopefully July will be as you'd expect. Are you going to the bother of getting stamps? It sounds like a really good event and the sort of distance, and climbs, I could manage, having done the Santander-Roscoff route in eight days, panniers and all, etc, so I might have to invoke Rule 5 and give this one a go in 2014. Good luck. I'd be interested to hear how you are tackling getting your bike out their?